Reach beyond the limits of convention and rationality and into the darkest corners of the human soul in this new volume of taboo-shattering short fiction. 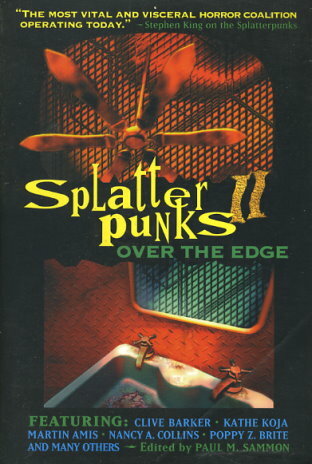 Splatterpunks II: Over the Edge continues in the groundbreaking tradition of the first volume by featuring acknowledged masters of the bizarre Clive Barker, Martin Amis, and Brian Hodge; established women writers Kathe Koja and Poppy Z. Brite; underground favorites and Bram Stoker Award-winners Nancy Holder, Melanie Tem, and Elizabeth Massie. Steve Rasnic Tem and Michael Ryan Zimmerman help round out this second daring collection. Provocative, shocking, and frightening, as well as literate, intelligent, and revolutionary, Splatterpunks II: Over the Edge promises to open your eyes to a new, and perhaps dangerous, way of looking at the World.